Wears a cool red and white suit, hangs out in medbay, yells at chemists scientists for not doing their job and gets yelled at by robotics for not letting them do theirs. 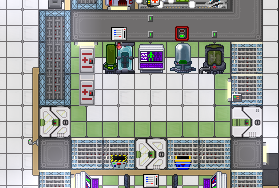 Space Station 13 is a dangerous place and you can expect to see much of the crew dropping by medbay to be treat their ailments. 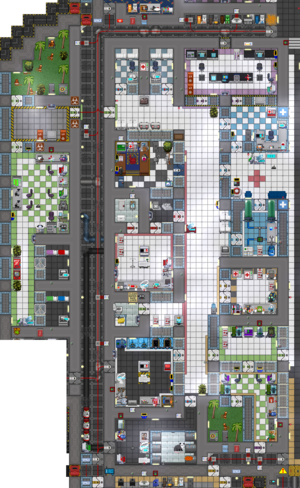 Your lockers, NanoMed medical dispensers, and Port-A-NanoMed contain vital equipment needed to save lives. Your hypos and syringes can be loaded with various medicine for ease of use. The reagent scanner and health analyzers are important diagnostic tools. There are separate hand-held devices, and every medical PDA includes app versions of them. 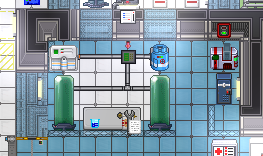 Regular health analyzers can be upgraded to show the chemical reagents currently inside a patient (but not the reagents inside other things) - check the medical vending machines/dispensers. The PDA's functions are separate (medical scan is on by default), whereas analyzers have an unified readout. You may have to enable the upgrade manually after installing it. Medical patches administer a lot of medicine at once and are plentiful. You can also inject chemicals into a blank patch with a syringe. Medical belts are a godsend if you're going to work outside of medbay, as they are essentially a medkit you can wear around your waist. Medbay only comes with a couple of these and they cannot be ordered by the QM, so it's in your best interest to snag yours as soon as the round starts. Alternatively, any ordinary tool belt can be used to store tiny and small items, i.e. most of the medical objects. You can dissolve pills in a beaker to withdraw medicine in a controlled manner, dispensing with a syringe or dropper. With a stable oxygen supply and the ability to dispense certain medicine such as saline, sleepers are decent to prevent further degeneration of a patient's health status and allow anyone to view the occupant's health. 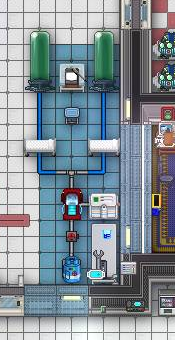 Sleepers can also be set to hibernation mode, keeping the occupant asleep while injecting them with rejuvenators automatically. If you have too many severely hurt patients to handle at once, you may want to stick some of the more stable ones in sleepers while you deal with the emergencies first. Sleepers can also be used to treat addictions, which are surprisingly common and hard to get rid of by other means. Health Monitor Implants and implanters/implant guns are not exactly healing tools but will make your job immensely easier by notifying your PDA of when and where the implantee is in critical condition or has died. 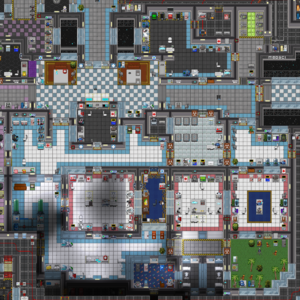 Medbay starts with a Head Surgeon. On any given round, there is a random chance that he will be a cardboard box or a medbot. 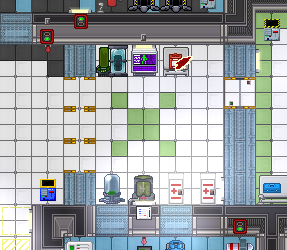 If he's a bot, let him treat minor injuries in the medbay lobby. 98-100% Perfectly fine. They can be on their way out now. 81-97% Hurt, but bearable. Needs some Saline and perhaps a patch or pill. 75-80% Needs some assistance. A quick pill or patch will do. 50-74% Hurting for some healing. Better look into it. 25-49% Terribly injured. Needs some serious assistance. 0-24% Close to dying. Tend to them urgently! <0% Dying! Get out the atropine/epinephrine and treat them quickly! N/A Dead. Bring them back. Check first though. N/A Implanted with a Health Monitor implant. Is the patient bleeding? Dress the wounds with bandages or suture, then check their blood level. If it's low, inject saline and use a blood bag on them. Saline will help stabilize an injured person. Styptic powder works again brute damage and silver sulfadiazine against burns. Charcoal is effective to treat toxin damage. In case of suffocation, use a salbutamol pill. Scan your patient by using your PDA or health analyzer and administer the appropriate medicine. People who have slipped into critical condition are at risk of falling into shock, cardiac failure or other terrible things and will die rapidly without treatment. CPR will help to keep them properly oxygenated and slow down the deterioration of their health. Just take off their mask and your own and target them with the help intent. 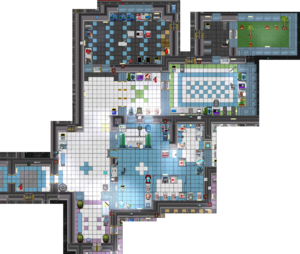 A patient who is thrown into cryo without being stabilized will take longer to heal and may die. In emergencies, an injection of epinephrine or atropine can help to rapidly resuscitate your patient, but don't overuse them! 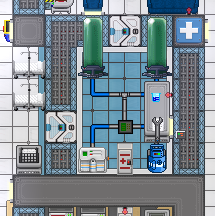 Between cryo, the various first aid kits and medbots, you have enough to treat most common ailments. For a more complex guide, check out Doctoring. You can also create cures, vaccines and beneficial pathogens. Check Pathology Research for more information. It's a good idea to invest a minute or two at the beginning of every round and start the cryo system. Make a habit of it. 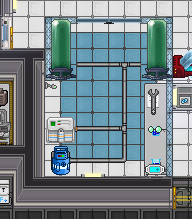 Click on the O2 canister to connect it to the pipes. 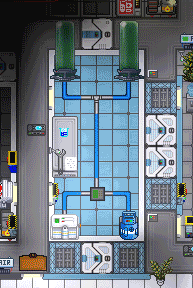 There should be two beakers of cryoxodone nearby. Pick up one at a time. 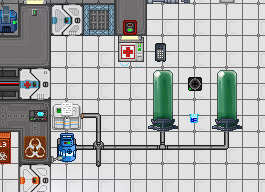 Add one beaker to each cryo tube by clicking on it with the beaker. Set the freezer to the lowest possible temperature if necessary. It should be 73.15 K, the default value. Flick the power switch and leave it on. 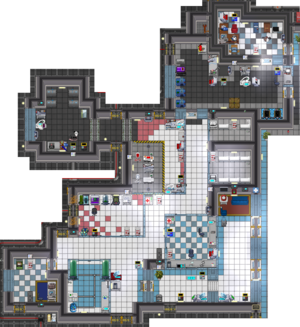 Add a health analyzer upgrade so you can view the reagents inside an occupant's bloodstream. 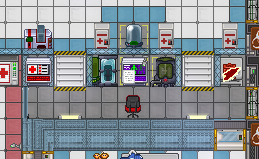 (Optional) Add a defibrillator, so that the cryo cell can reverse cardiac failure. Don't worry about the cryoxadone - it isn't used up unless there's someone inside the tube. If it does run out, you simply inject some in with a syringe or insert a fresh beaker of cryoxadone. However, leaving the chambers on causes a slow but constant gas leak. To avoid draining the O2 canister needlessly, leave the tubes off unless they're occupied. Stabilize the patient with CPR or stimulants. Check the cryo tube to see whether the gas temperature is still optimal. 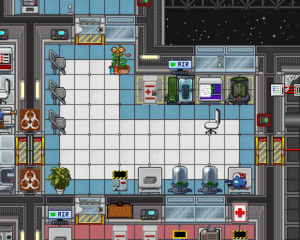 If the patient is wearing any type of exosuit (space suit, lab coat etc.) or headgear (mask, hat), remove them. 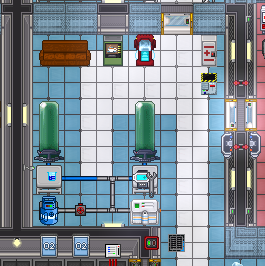 Stuff the patient into an unoccupied tube and turn it on. If the cell is outfitted with a defibrillator, and the occupant is in cardiac failure, ZAP THEM! Monitor their recovery. 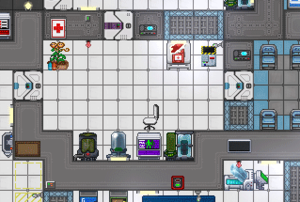 Clicking on the cryo tube will pop up a window with the occupant's current health. Once they have fully recovered, the system will eject them automatically. Turn off the cryo tube at this time. Verify their status with your PDA or a health analyzer, especially if they had poison in their system or were suffering from heart failure. To stress the point, it is important that you don't forget to strip your patient of exosuits and headgear. Their body temperature has to fall below a certain threshold, which is unlikely to happen if they still have said items on, or cryoxodone won't work. Plain and simple. It is also noteworthy that pure oxygen is not a requirement. Should you ever need to replace the gas supply, an air mix canister from emergency storage or the air hookups will work just as well. Sadly, you won't always be able to save the patient. 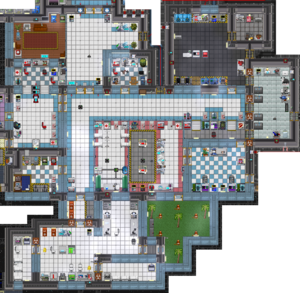 This is where the cloning apparatus comes into the play, which was formally the geneticist's responsibility and is now open to all medical personnel. Use the Grab intent on the subject and then click on the scanner to load them in. You can also click-drag the subject's sprite onto the scanner's, which will make you do the previously mentioned steps but faster and automagically. Click on the Cloning console with an empty hand and choose Scan. This step will (usually) add them to the Cloning Records, and will also give them a Health Monitor implant. Cyborgs and helpful AIs can simply click on the Cloning console, allowing a helpful silicon to control this process if you have a mind to let it to. Click on View Records and find the person you want to clone. Click on their record. Click Clone to start the cloning process. Right-click the scanner and choose Eject to take them out of the scanner. You can also use the Eject verb from the Local tab, enter Eject into the command bar, or just click-drag the scanner sprite onto a floor tile. If someone comes in to get scanned of their own accord, they can climb in and jump out of the DNA scanner themselves. 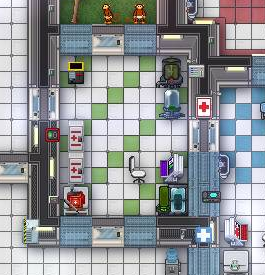 If someone has the initiative to come in and get scanned on their own, it is polite to attempt to clone them every 10-15 minutes. The one time it works you can be assured they were dead in a maintenance tunnel somewhere. Once the cloning process starts, it normally takes about 2 minutes for it to complete. When a clone stumbles out, they are naked, and usually have some combination of toxin damage and brain damage. Charcoal and mannitol respectively will fix these problems. Give them some new equipment from their old body if it's still around and send them on their way. The cloning process won't always go so smoothly however. Sometimes, there's number of errors and problems in the process. Luckily, there's (usually) a number of alternatives! Error: Mental interface failure Subject has logged out or gone braindead. Also possible if you try to scan someone who's already being cloned. Not much. 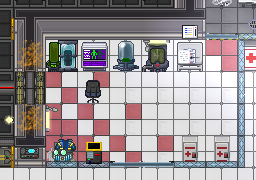 You can put their brain into a cyborg body/AI unit so they'll have something to do when they log back in, but you'll have a useless Cyborg/AI in the meantime. Strange reagants and brain transplants will result in another braindead player. Ephemereal conscience detected, seance protocols reveal this corpse cannot be cloned. Subject has set themself to Do Not Revive. Move on. There's no way to revive them, not through Robotics or Chemistry, and they don't want to be. Error: Failed to read genetic data from subject. Necrosis of tissue has been detected. Subject's corpse is too decayed for cloning. Send them to Robotics. Or find the upgrade that'll bypass it somewhere in Space. Or reanimate them with wacky, hacky medical procedures. Error: Extreme genetic degradation present. Subject is the husk of a Changeling snack. Send them to Robotics. Or use mad science to bring them back. Insufficient biomatter to begin. Biomatter reserves in cloning pod are less than 15% full. Shove a dead body or some organs into the Enzymatic Reclaimer. Click on the corpse with grab intent then click on the reclaimer to shove it in. Click on it again to activate it. 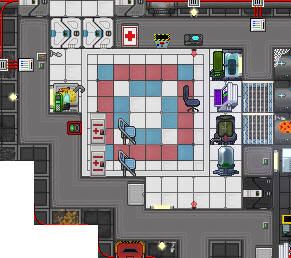 Cloning pod emits a horrible burst of blood, gibs, and organs Subject has the Purtian trait. Send the corpse to Robotics for borging. If the corpse is still fresh, you can still bring them back with the power of chemistry, and if their brain isn't missing, you can do a Brain transplant. Clone Rejected: Deceased. Subject has committed suicide while in the cloning pod. Move on. They likely wanted to stay dead, for a number of reasons. Unable to initiate cloning cycle Subject has logged out or gone braindead Not much. You can however still scan and try again later. In addition, the cloner can augmented with several modules. Some speed up the process significantly, some change the amount of biomatter used in each cycle, some even allow you to give clones a certain mutation. Check them out in your own free time. If cloning is damaged or destroyed it can be possible to make a new one elsewhere, but unless some individual components were scanned first it might be tough. Never use the Harm intent, basically. Like it says, disarm actions are still kosher. Just do what you normally do, and this objective basically completes itself. 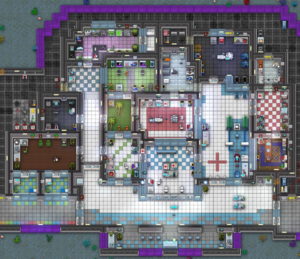 If for some reason you are lacking in people to treat, just punch yourself a few times and apply a few medical patches, if you don't mind wasting resources. If you get this objective, ignore it until near the end of the round. When the shuttle is about to dock, turn the tanks on. If left on for the whole round, the connected gas canister will be drained fairly rapidly, so don't do it please. The traitor medic has the right tools for quiet assassinations and all-out rampages. 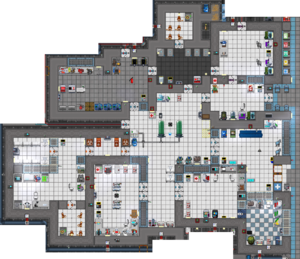 Emagging your hyposprays will let you load them with whatever you want, instantly injecting your targets with any variety of harmful chemicals. Your medical vending machine starts out with a few nice ones (such as sleep toxin), and more potent drugs can be made if you're able to slip into chemistry. Failing that, poison bottles are well-priced and a good option. Emagged sleepers will inject the occupant with poisons, which is best combined with hibernation mode. 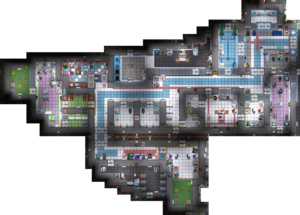 Generally, no one will stop to question a doctor dragging an injured crew member or corpse, so long as it's towards medbay. You have equipment to restrain and anesthetize any downed victims, and the manufacturer in robotics next door can be hacked to make flashes. 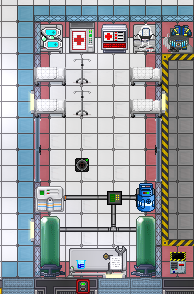 For the more overt killer, you can use the syringe gun, which draws harmful chem of your choice from an internal reservoir and fires them at people.